Not “Most Talented” or “Most Likely to Succeed,” but “Always Seen Eating.” Looking back, maybe the reason I was always hungry was because my body wasn’t digesting and absorbing food properly because of undiagnosed Celiac disease. Who knows for sure? Regardless of how much I like to eat, I do not enjoy making something that takes more time to prepare than it does to eat. That’s just me. The obvious exceptions to this rule are things like lasagna, soups, and other dishes that we can enjoy for a few days. Or baked goods which can be frozen and used in the future. I actually enjoy making those things even though they may take a while. You can download it and print the pages you want. 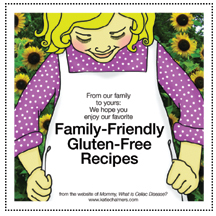 Enjoy and look around the site for more recipes that your g-free kids will love! Thanks! These look great! It’s nice to have kid-tested & approved recipes! Where are you seeing the recipe for marshmellow suckers? I see the picture but no recipe? thanks! Hi Lori. Sorry ’bout that…. I have posted those marshmallow pops so many times on my Facebook page and website but I never bothered to put together a formal recipe together for it. Just do a search on my site for “marshmallow” and you’ll find directions in those posts. Have fun! You have a lovely website! Its so great to have a gf one aimed for kid stuff! Just what I needed to see today! :)I I will definitely be following!!!! Love the peanut butter cookie recipe. Different variations have been around for decades. They are very yummy!